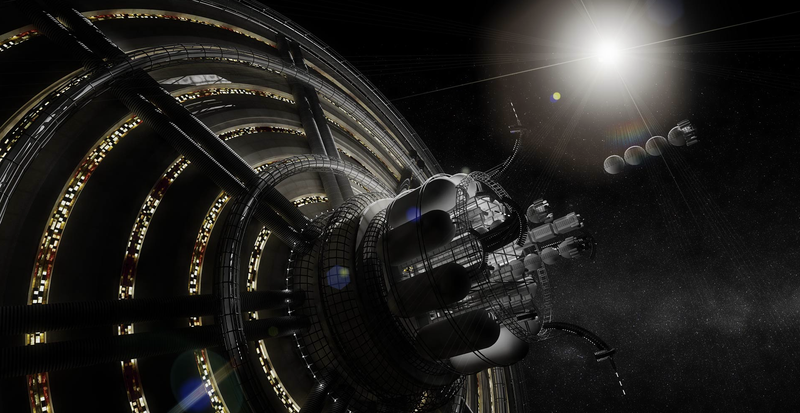 White House Seeks Advice On "Bootstrapping A Solar System Civilization"
The White House Office of Science and Technology Policy is planning ahead — way ahead. The agency wants you to email ideas for how "the Administration, the private sector, philanthropists, the research community and storytellers" can develop "massless" space exploration and a robust civilization beyond Earth. Tom Kalil, the Deputy Director for Technology and Innovation, says that in one of his meetings with NASA, a senior official with the space agency observed, "Right now, the mass we use in space all comes from the Earth. We need to break that paradigm so that the mass we use in space comes from space." As Kalil notes, NASA is already working on printable spacecraft, automated robotic construction using regolith and self-replicating large structures. As a stepping stone to in-space manufacturing, NASA has sent the first-ever 3D printer to the International Space Station. One day, astronauts may be able to print replacement parts on long-distance missions. And building upon the success of the Mars Curiosity rover, the next rover to Mars — currently dubbed Mars 2020 — will demonstrate In-Situ Resource Utilization on the Red Planet. It will convert the carbon dioxide available in Mars' atmosphere to oxygen that could be used for fuel and air — all things that future humans on Mars could put to use. But if we want to want to create a robust civilization in our solar system, more of the energy, raw materials, and equipment that we use in space has to come from space. Launching everything we need from Earth is too expensive. Kalil spoke to Phillip Metzger, a former research physicist at NASA's Kennedy Space Center who has recently joined the faculty of the University of Central Florida, to discuss the longer term goal of what Metzger calls "bootstrapping a solar system civilization." In a recent article, you and your co-authors called for "affordable, rapid bootstrapping of a solar system civilization." What do you mean by "bootstrapping" in this context? Ultimately what we need to do is to evolve a complete supply chain in space, utilizing the energy and resources of space along the way. We are calling this approach "bootstrapping" because of the old saying that you have to pull yourself up by your own bootstraps. Industry in space can start small then pull itself up to more advanced levels through its own productivity, minimizing the cost of launching things from Earth in the meantime. Obviously, this isn't going to happen overnight, but I think that it is the right long-term goal. Why do you think that developing the capability for a self-sustaining space industry would be a desirable goal? We need to realize we live in a solar system with literally billions of times the resources we have here on Earth and if we can get beyond the barrier of Earth's deep gravity well then the civilization our children and grandchildren will build shall be as unimaginable to us as modern civilization once was to our ancestors. The challenges we face are not only those related to sustainability and the resource constraints of a finite planet. We are running out of adventures, too: the mountains have all been climbed, the continents explored, and the romance of sailing away on a tall ship to undiscovered islands is no more. What will fire the imaginations of the next generation? For example, future generations might build a space telescope described by astronomer Seth Shostak, which would consist of a constellation of mirrors spread out over a 100 million miles. Such as telescope would be capable of taking a picture the size of an automobile on a planet orbiting a star that is 100 light years away! This would be the equivalent of seeing an object the size of a cell nucleus on Pluto from Earth. What kind of terrestrial demonstrations would accelerate the development of these technologies? NASA already holds several annual robotics competitions focused on different technology areas like mining regolith or navigating across rough terrain. These have proven invaluable to advance these specific technologies as well as to inspire students. I think the next step is to integrate multiple technologies, holding a regular series of field tests where robotics and manufacturing units work together to do more complex operations. For example, we could meet on a volcanic deposit or in desert terrain and have robotic excavators delivering regolith into solar-powered materials processing units, which create feedstock for 3D printers to make spare parts, so assembly robots can install the parts back onto the excavators. This will be the rudimentary beginnings of a supply chain. With each field test we will learn, we will stretch our goals for the next field test toward a more complete supply chain or a more complex operation, and the teams will evolve their technologies. These tests could be competitions or they could be collaborative demonstrations where we all work together. Participants could include industry, universities, and/or government teams. A major component could be participation of the Maker community. More advanced field tests may include solar cell manufacturing, propellants production, vertical takeoff/vertical landing (VTVL) spacecraft operation, automated refueling of vehicles, and refining of metals. The government will learn an enormous amount from sponsoring these competitions. As a NASA employee, I was regularly a "regolith judge" at space mining competitions, and I can attest that I learned more each year during the competition than I did during the rest of the year. Forty creative, enthusiastic university teams building robots leveraged our own efforts forty-to-one. Have ideas on how to further these goals? If so, email them to massless@ostp.gov.